my dad is on a big job right now - up at 7am and home by 7pm, dinner, the office work until 9:30pm. my dad loves all things apple. so i decided he would be the lucky one to receive this cake. 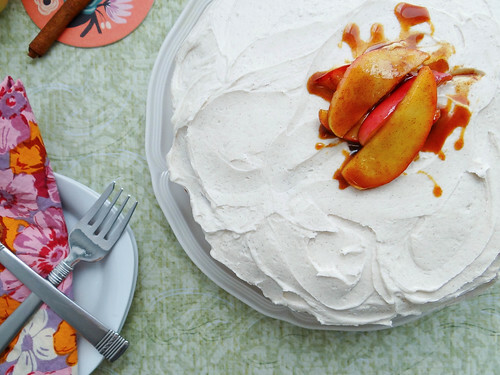 apples, salted caramel & cinnamon frosting - really, what's not to love about that? the cake is simple - a vanilla cake. 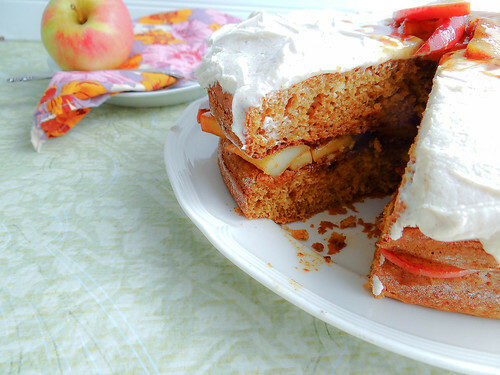 i really wanted to the apples to be the main focus - which they were....along with the cinnamon frosting which was amazing. justin asked if he could just eat the top layer and give my dad the apple covered bottom - say what? that boy is crazy, nuh uh not happening. my dad planned on bringing this with him the next day to the job to share with my uncles. i made him promise that he wouldn't tell them it was vegan until they both ate a slice...they aren't the ones that are so open minded- that's my mom's side. they are coming around though! i of course snuck the photo op piece for myself and shared it with justin. we have been making a real effort to limit our sweets to the weekend only - for a while there we were on a sweets overload! 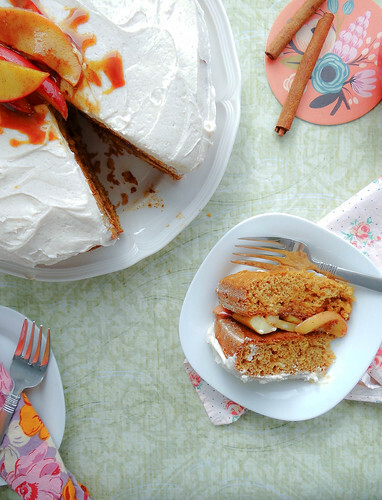 do you ever find yourself with a super sweet tooth - like an every night, gotta have dessert? - which is actually pretty awesome. every year i go apple picking and every year i come home with way to many apples. 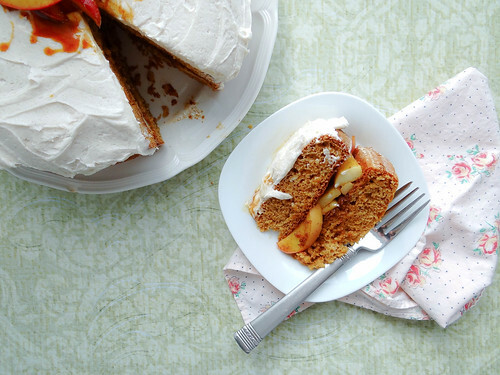 tell me, do you have a favorite apple recipe that you can't live without? 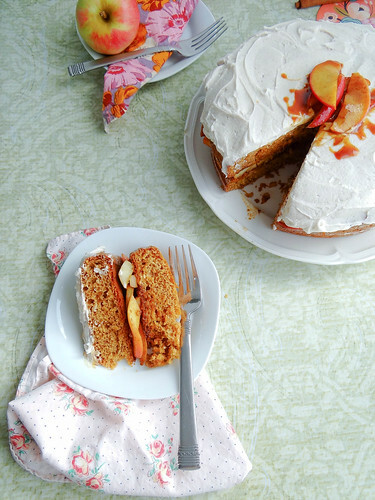 this cake would make a beautiful addition to a fall harvest dinner or thanksgiving day. and don't forget halloween - this would be perfect to serve to any guests that drop in! in another medium mixing bowl, combine all wet ingredients - mix really well. add the wet to the dry and stir until just combined (no flour clumps) do not over mix. pour cake batter evenly between the 2 pans - tap pan on the counter to disperse any air bubbles. bake in the pre heated oven for 18-20 minutes, or until a cake tester comes out clean when tested in the center of each cake. remove from oven and allow to fully cool on wire racks. in a medium saute pan, heat vegan butter over medium high heat - when melted stir in cinnamon. add in apples and toss to coat. cook over medium high heat until softened. 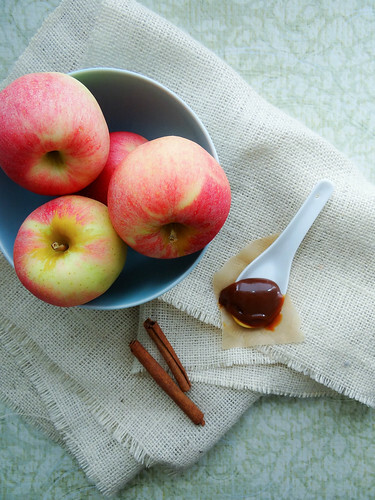 reduce heat to low & add vegan salted caramel - stir until apples are well coated with caramel. 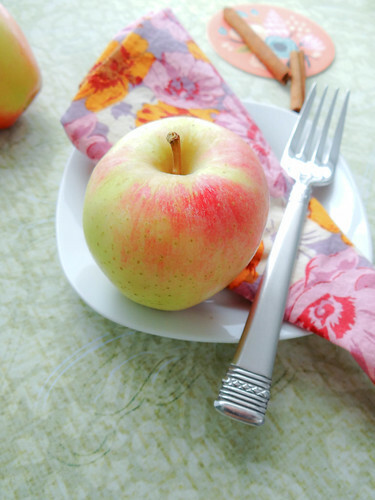 turn off heat and set apples aside until ready to use. in a stand mixer with the wire whisk attachment - add powdered sugar and vegetable shortening - whisk on low until small pea size piece form. slowly add milk & vanilla -mix on medium until consistency you desire is achieved. once the cakes have fully cooled run a knife around the edge of each cake pan. invert one round onto a serving platter. 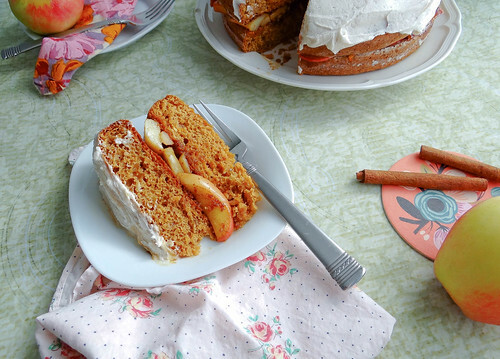 top cake round with salted caramel apples.- reserving a tablespoon of apples to garnish the top of the cake. 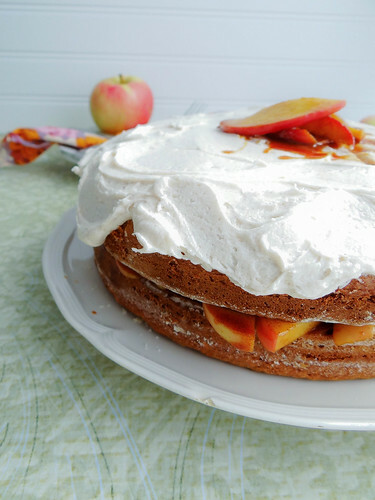 place the second cake round on top of the apples. 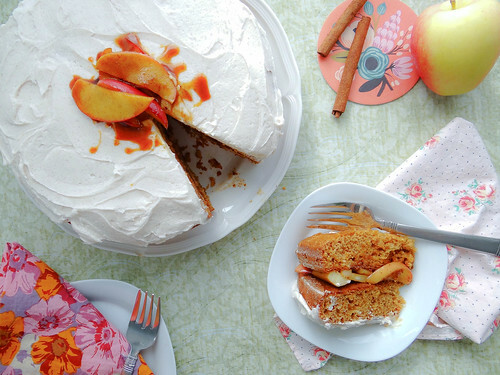 frost the top of the cake with cinnamon frosting and garnish with reserved apples. Very lovely. I have a jar of caramel sitting around too. I have been considering using it in a tart. But I definitely have at least one housemate who has slowly been sneaking spoonfuls. I can't judge them. Who could resist? Thanks Shannon! the tart sounds like such a great idea - seriously who can resist an open jar of salted caramel! This looks so delicious. 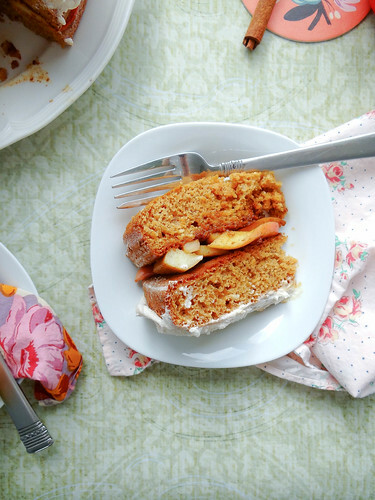 The perfect autumn cake..Your photos are making be hungry for cake and it is 9 am ! 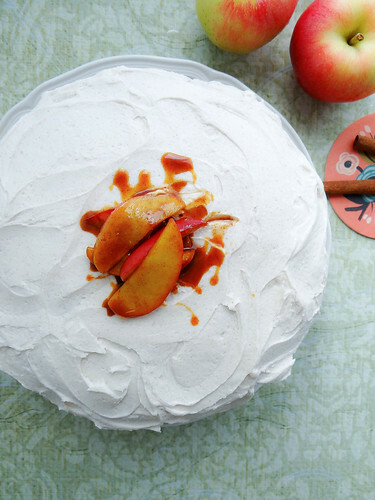 What a beautiful cake to celebrate the arrival of fall. I love the sautéed apples in the middle. I'm going apple picking again next week. Maybe I need to add this to my list of things to make...yum! It totally has your name all over it! Amazing :) Nothing describes this cake better! And how sweet of you to make it for your dad during his hectic time! I can't wait for apple picking next week! I absolutely love the filling! Thanks Richa it was fun to photograph! Another beautiful cake Heather! 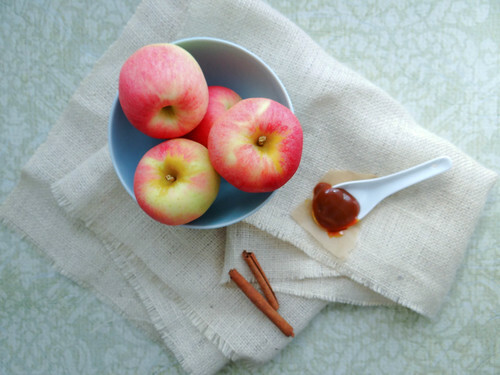 Love the apple and cinnamon combo for Fall, and that's so sweet to think of your dad that way! 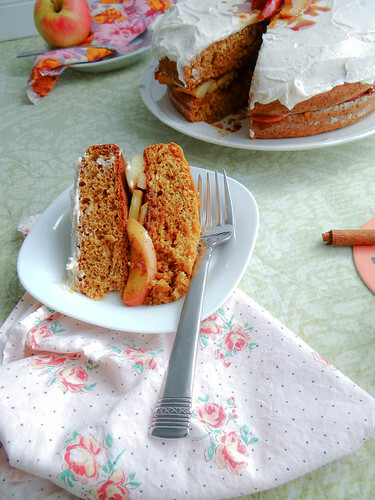 I would even just make a single layer of this cake and top it with a spoonful of that apple filling...mmm I love warm sauteed apples and pears! Thanks Genevieve - I bet pairs would be an awesome sub in for the apples or a combination of the both! holy cow there is some serious deliciousness going on in there! i love all the flavors of fall! yum! so pretty and looks so yummy. i have been wanting to make salted caramel for a while, this just might be the recipe I try it out in!